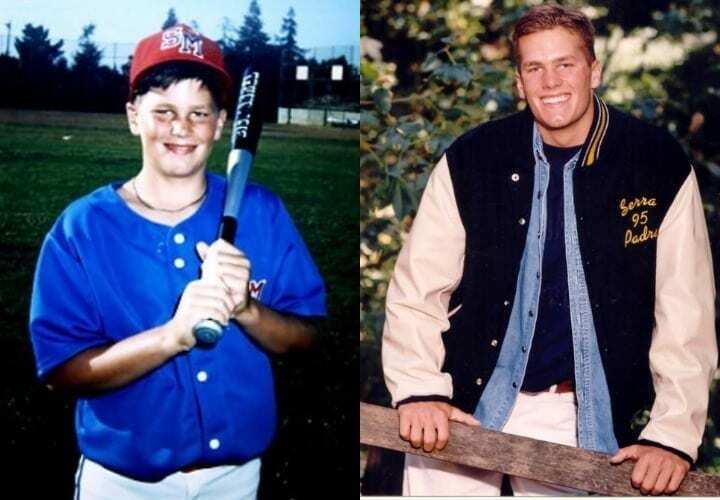 Yeah, Tom Brady looked pretty much the same in high school and college compared to how he looks today. But Odell Beckham Jr.? Not so much? 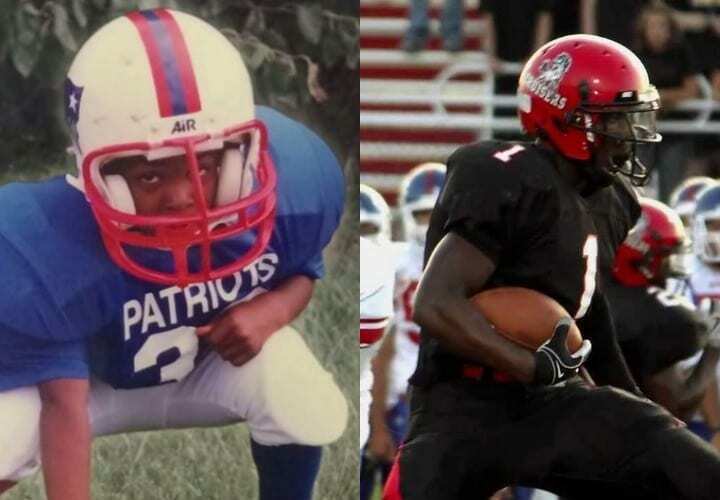 Let’s check out how some of today’s brightest NFL stars developed from Pop Warner to the pros. 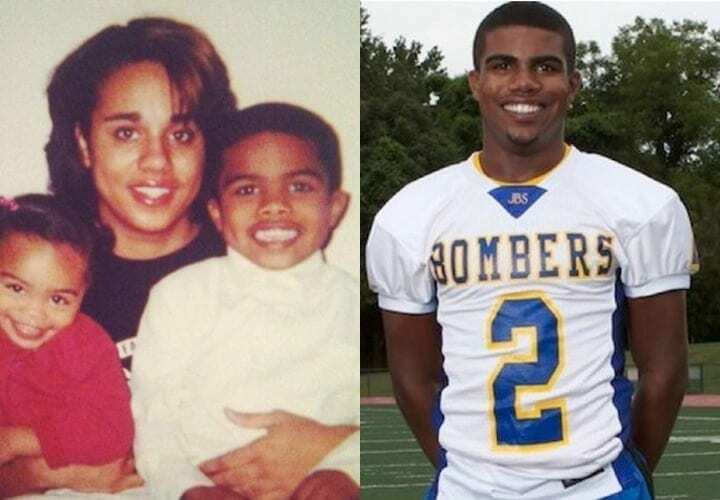 Ezekiel Elliott was born into a family of sports and didn’t let the family name down. Elliott grew up in the St. Louis suburb of Ladue and attended the John Burroughs School. There he starred as a three-sport athlete in football, track, and basketball. But crossovers weren’t nearly as fun trucking through people, and Elliott began to focus exclusively on football. After high school, Elliott attended The Ohio State University. As a Buckeye, Elliott became one of the nation’s most prolific runners. He finished his sophomore campaign a national champion and capped off his junior year with a win over Notre Dame in the Fiesta Bowl. In the 2016 NFL Draft, the Dallas Cowboys selected Elliott with fourth overall pick. He finished his stellar rookie campaign with 16 touchdowns and a Pro Bowl appearance. Although wearing a crop top is questionable, no one questions Elliot’s skill set. In just a matter of years, he’s become one of the NFL’s premier backs. 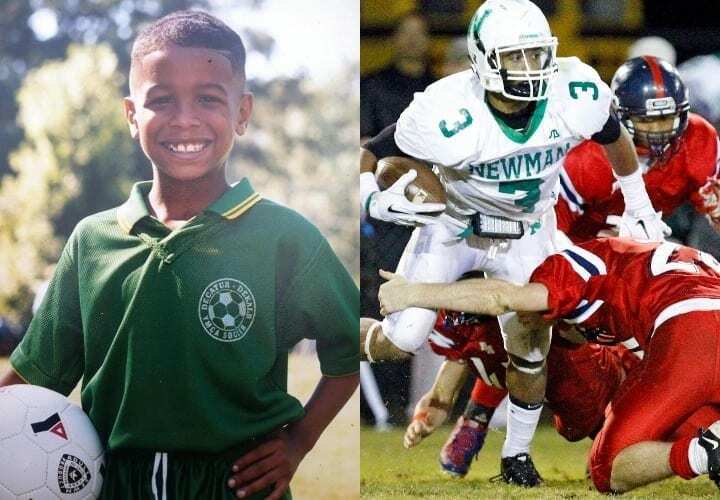 Before the sideline antics, the questionable decisions, and the jaw-dropping plays, Odell Beckham Jr. was just a kid excelling at numerous sports. Beckham grew up in Baton Rouge, Louisiana., to the son of a former LSU running back, Odell Beckham, and an All-American sprinter, Heather van Norman. Thanks to his genes, Beckham Jr. was a star from the start. Considered an elite youth soccer player, OBJ elected to focus on football, his first true love. While at Isiodore Newman School high school, Beckham shattered numerous records and drew the attention of scouts nationwide as a four-star receiver. He was athletic, big, and played the game with a tangible passion. 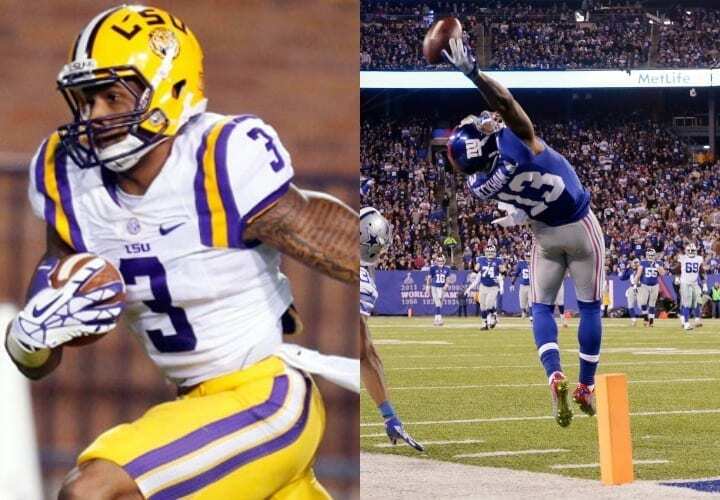 When signing day came, Odell decided to keep it local and attend Louisiana State University. With the Tigers, Odell grew into his now-massive hands and snared balls with ease. Following a 1,000 yard, eight touchdown junior year, Beckham Jr. declared for the NFL Draft. Taken 12th overall in the 2014 NFL Draft, Beckham and quarterback Eli Manning instantly clicked and the dramatic receiver promptly became one of the biggest deep threats in football. Since entering the league, Beckham has been selected for thee Pro Bowls and two All-Pro teams. Weekly, the star receiver constantly draws national attention for his amazing, acrobatic catches and absurd off-field antics. With Eli Manning’s career on the decline, it will be up to OBJ to carry the team and keep the Giants relevant in New York. 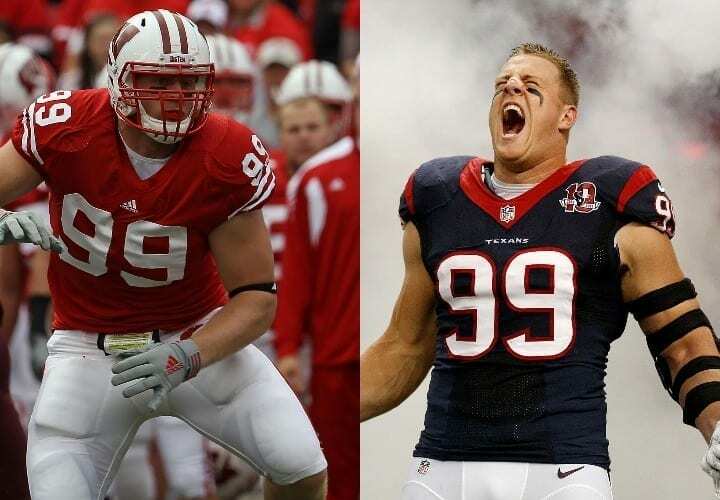 One of the best defensive players in the NFL, J.J. Watt, wasn’t even on the radar of most big schools after graduating high school. Watt grew up in an athletic household and was a travel hockey player into his early teens before dropping the sport because of the financial burdens. 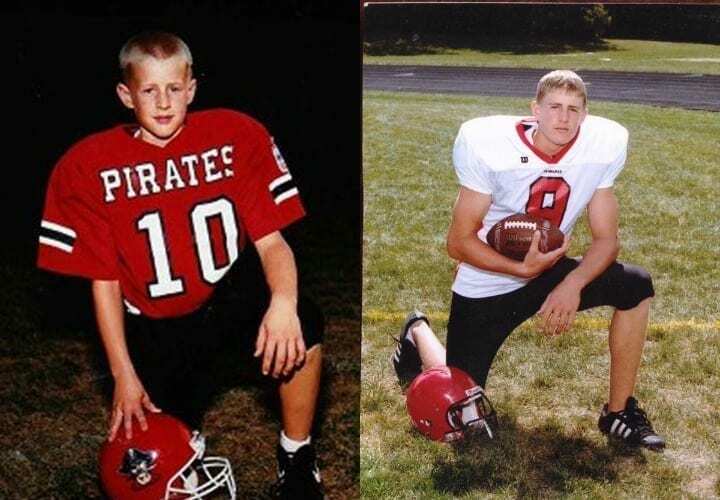 At Pewaukee High School in Pewaukee, Wisconsin, J.J. was a four-year letter winner in four sports. Playing tight end and defensive end, Watt was named to the first-team All-State. In the shot put, Watt set his school’s record and won the state championship. In spite of his abilities, he was only considered a two-star recruit. With no major offers, Watt attended Central Michigan University. Not satisfied with his role on the team, Watt dropped his scholarship for a chance to walk on to the University of Wisconsin Badgers. In his two years at Wisconsin, Watt showed unlimited potential and a sky-high ceiling thanks to an outstanding work ethic. In the 2011 NFL Draft, Watt was selected by the Houston Texans 11th overall. Since entering the league, Watt has become one of the game’s premier defensive players. He’s a four-time Pro Bowler, four-time First-Team All-Pro, and three-time Defensive Player of the Year, but his most notable contribution came off the field. After Hurricane Harvey, Watt raised over $37 million in relief efforts and was named both the Sports Illustrated Sportsman of the Year and the Walter Payton NFL Man of the Year. We all know Tom Brady is the GOAT, but reaching that status wasn’t an easy path for the kid from northern California. Born in raised in San Mateo, Calif., Brady grew up playing baseball and football and attended Junipero Serra High School. At the high school level, Brady struggled to get on the field, but eventually got the nod following an injury to the incumbent starter. 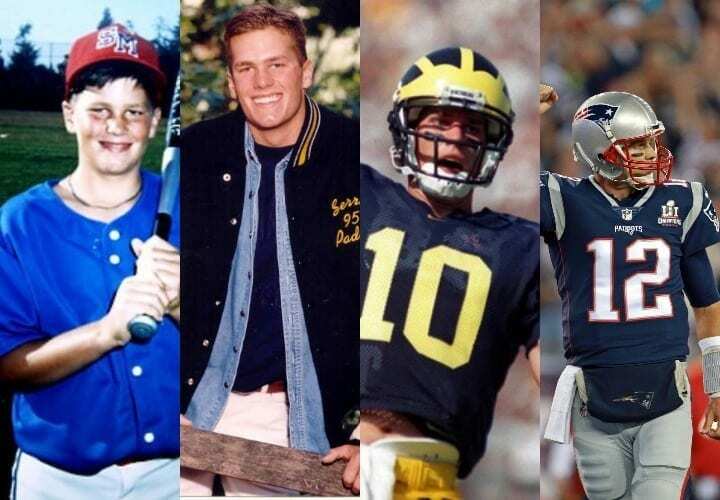 Despite being drafted by the Montreal Expos, a team that showed great interest in the power-hitting catcher, Brady opted to stick with football and attended the University of Michigan. Not heavily recruited, Brady went into Michigan as a backup deep on the team’s bench. At Michigan, Brady suffered from deja vu and was deep on the bench behind a roster full of quarterbacks. But once again, Brady emerged from the pack and started his every game his junior and senior year. He capped off a stellar two years with a come-from-behind victory against Alabama in the 2000 Orange Bowl. But again, Brady was overlooked. 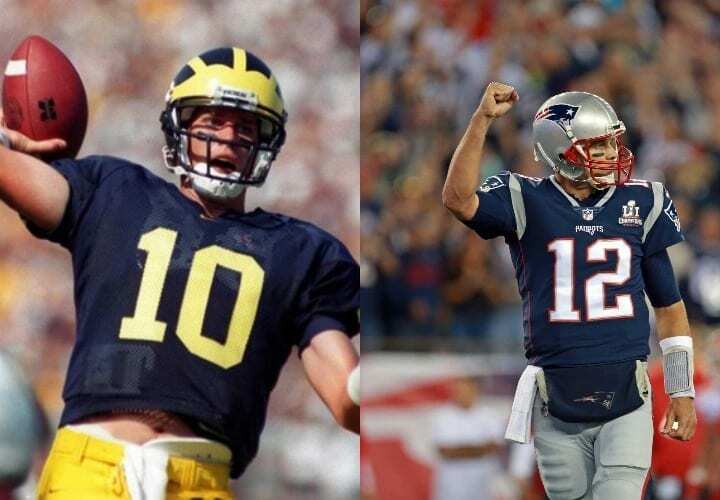 NFL scouts laughed at his physique and athletic ability, and despite two big seasons playing for one of college football’s most prestigious schools, Brady fell to the 199th overall pick in the 2000 draft. In the NFL, the story would again repeat itself. Brady would be a backup and only squeaked into the game thanks to a Drew Bledsoe injury in 2001. After that, the rest was history. Brady became the most prolific quarterback in NFL history while leading the Patriots to five Super Bowl victories and an unprecedented run of AFC dominance. He’s one of the most comical players in the NFL and also one of the most dangerous. 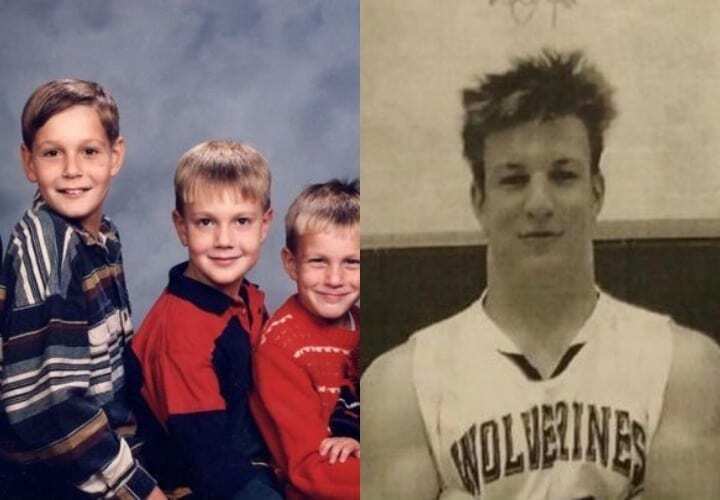 Tight end Rob Gronkowski grew up in western New York to a family full of athletes. 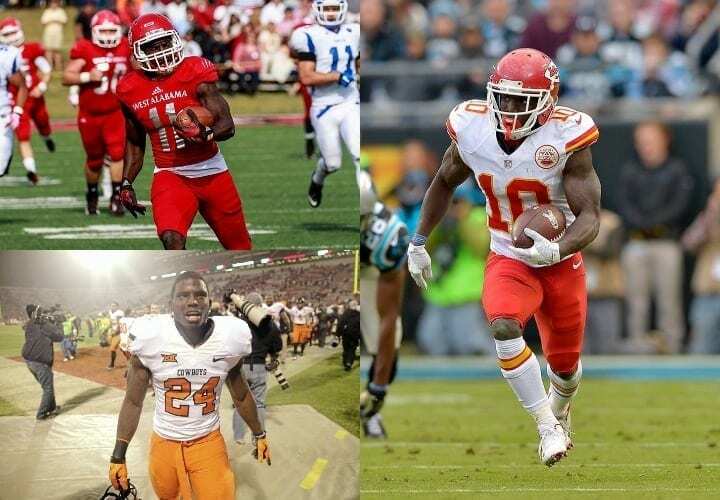 Out of his four brothers, all played collegiate sports and three went on to have NFL careers. For his senior year of high school, Gronk move to Pittsburgh and was a heavily recruited college prospect. What was not to love about Gronk? He loved hitting, blocking, and playing the game. When he got the ball, he was a bear to tackle thanks to his sheer size and athleticism. 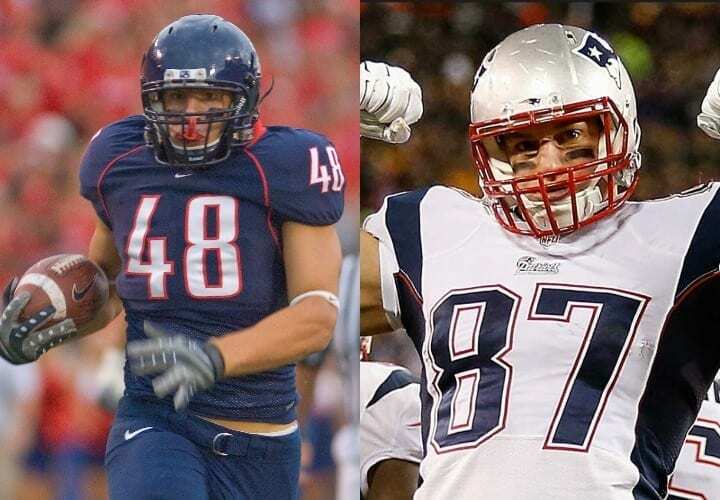 Gronk chose to attend the University of Arizona and immediately made an impact for the Wildcats. He was a freshman All-American with a bright future. His sophomore campaign, 2008, was even more successful and saw Gronk haul in 10 touchdowns. After missing his entire junior year due to injury, Gronk opted to forgo his senior year and head to the NFL. Selected 42nd overall in the 2010 NFL Draft by the Patriots, Gronk has proven himself to be the most elite tight end in NFL history. He’s a two-time Super Bowl champion, five-time Pro Bowler, and four-time first-team All-Pro. In the 2011 season, Gronk became the first tight end in NFL history to lead the league in receiving touchdowns (17). He also holds the Patriots franchise record for receiving touchdowns. Although numerous seasons have been cut short due to injury, Gronk still remains the most dominant tight end in the NFL and possibly the greatest single offensive weapon in the NFL. Although born in North Carolina, Carson Wentz moved to North Dakota at the age of thee, settling in Bismark. 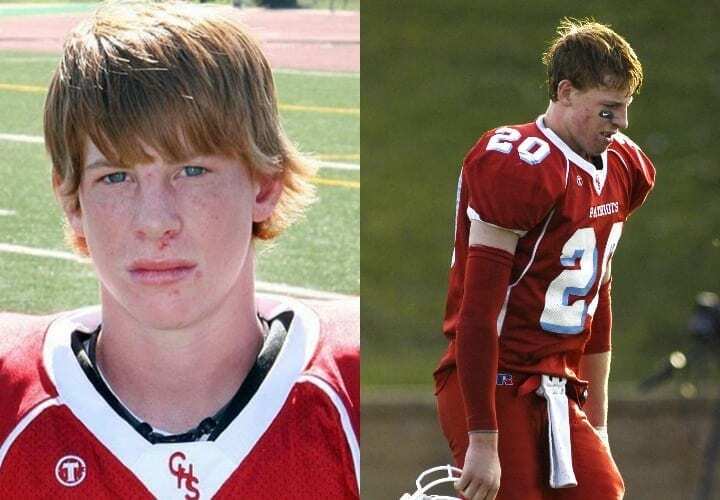 At Century High School, Wentz was All-Conference at quarterback and defensive back. He also shined on the basketball team that was ranked first in the state. But Wentz isn’t just brawn. He graduated as a member of the National Honor Society and was the class valedictorian. However, Wentz received little interest from colleges outside of his home state. 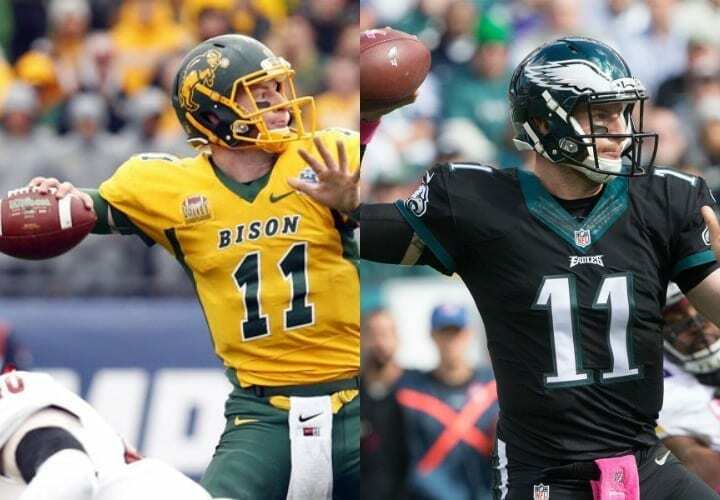 With limited choices, Wentz elected to attend North Dakota State University, an FCS school. Little did he know, this move would turn out to be one of the best decisions of his life. After redshirting his freshman year (2012), Wentz found himself in a backup role until his junior year. Once Wentz finally took the field, he never looked back. While being a member of five-straight FCS championships, Wentz solidified himself as one of the best quarterbacks in the nation- FCS or not. Following a strong showing at the Senior Bowl, Wentz was projected to be a mid-first round pick, but the Eagles jumped on the opportunity and grabbed him with the second overall pick of the 2016 NFL Draft. So far, Wentz has proved worthy of all the hype. In just his second season in the league (2017), Wentz was named to the Pro Bowl and All-Pro teams. Despite going down with a season-ending knee injury during a Week 14 matchup against the Rams, Wentz positioned the Eagles for a deep playoff run, a run that ended with a Super Bowl victory over the Patriots in Super Bowl LII. 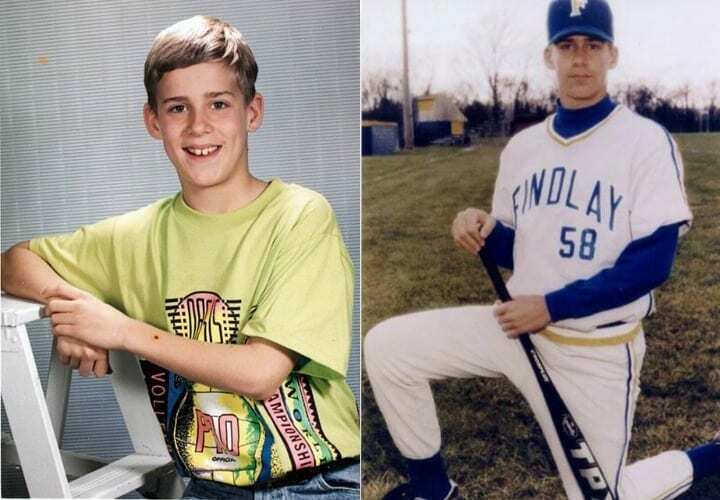 A casual California kid, Aaron Rodgers spent part of his childhood in Chico, and Beaverton, Ore. 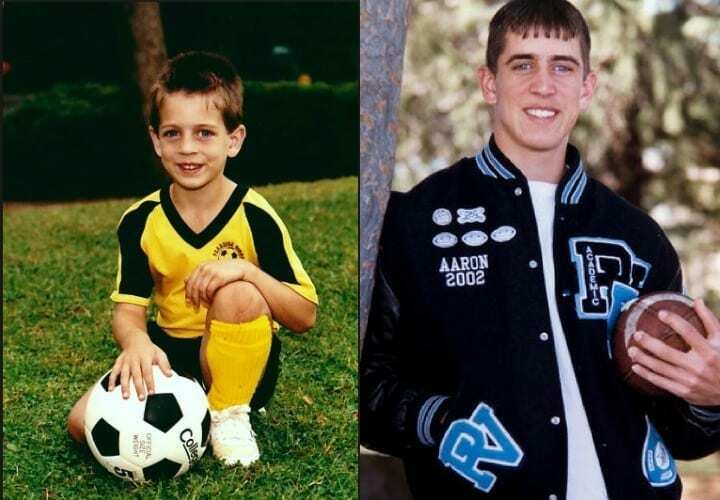 In 1997, the Rodgers family moved back to Chico, so Aaron could attend high school in his hometown. As a 5-foot 3-inch freshman for Pleasant Valley High School, Rodgers could barely see the field and never saw playing time. 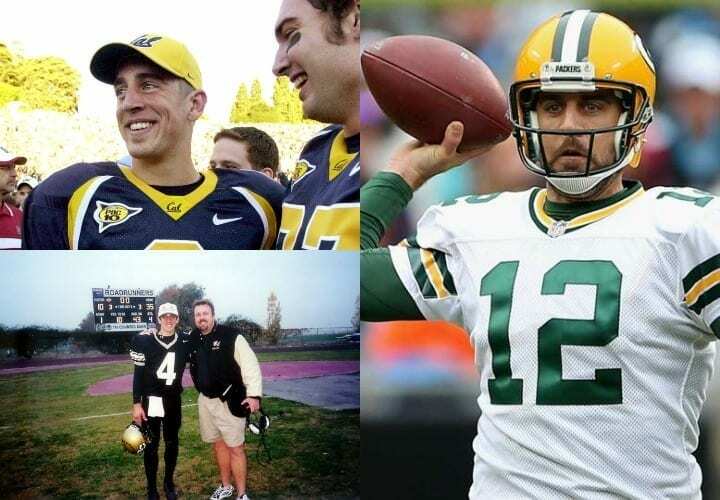 But during his junior and senior years, Rodgers had growth spurts and was named the starter. Despite two strong years starting, Rodgers didn’t receive any Division I scholarship offers. Not even his hometown team, Cal, extended an offer. Not interested in walking on, the door seemed to be closing on Rodgers’ football career. With no viable options, Rodgers attended Butte College (pictured below, left), a junior college in Oroville, Calif. After one year lighting up scoreboards, Rodgers transferred to Cal. Following two impressive years at Cal, Rodgers declared for the NFL draft. The Packers selected him with the 24th overall in the 2005 NFL Draft. Slated to backup and eventually replace Brett Favre, Rodgers’ NFL career got off to a slow start. Since becoming a starter, he’s won a Super Bowl and two MVP awards. He’s also widely considered the best pure passer in the league. However, he’s only brought one ring to Green Bay, and fans are beginning to lose patience with the head coach and management for not surrounding Rodgers with enough tools to win it all. Two Division 1 schools and a JUCO college experience. 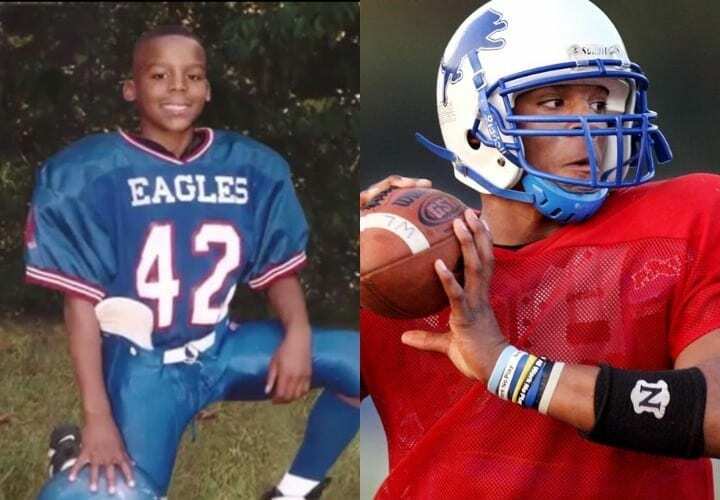 Cam Newton’s road to Heisman Winner, first overall draft pick, and NFL MVP wasn’t traditional and it wasn’t easy. It wasn’t a lack of talent, but a matter of circumstance that made his journey longer and harder than it needed to be. But who knows, maybe the road he took was the perfect way to develop the quarterback into the MVP-caliber player he is today. Newton grew up surrounded by a family of athletes. His dad made an NFL roster but was cut before the regular season. His brother, Cecil Newton Jr., played center in the NFL. Born and raised in a suburb of Atlanta, Newton starred at Westlake High School. 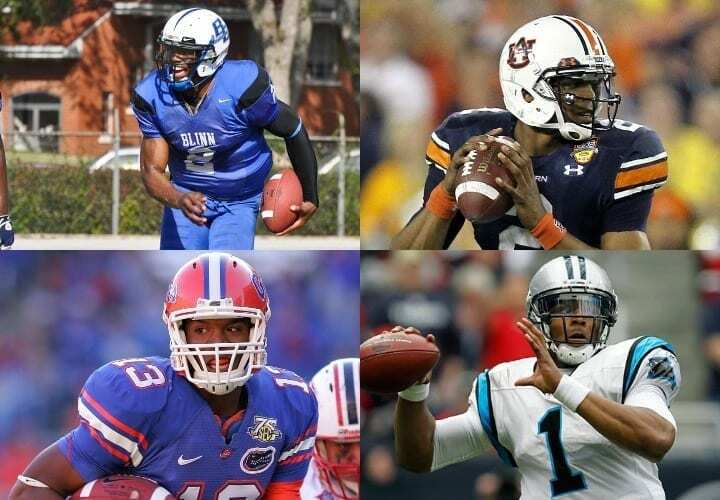 Considered the nation’s second best dual-threat quarterback prospect, Newton was a five-star recruit and attended the University of Florida. That tenure with the Gators, backing up Tim Tebow, was tumultuous because of injury and petty crime. Facing potential dismissal from the team, Newton elected to leave Florida and attend Blinn College (upper left) in 2009. Newton became the highest-ranked JUCO player in the nation during his one year at Blinn. For his efforts, he earned a scholarship offer from Auburn University. In his lone season with the Tigers (2010), Newton won the Heisman trophy and a national championship. Selected 1st overall in the 2011 NFL Draft, the Carolina Panthers had their game-changing franchise quarterback. To date, Newton has become the most prolific running quarterback in NFL history. He led his team to Super Bowl 50 where they lost to the Broncos. That season he was awarded the league MVP. As long as his body can remain healthy — he does absorb a lot of big hits — expect Newton to maintain his high level of play for years to come. Hailing from Norcross, Ga., Saints running back Alvin Kamara is electric, exciting, and unpredictable, just like his ascent to the NFL. Raised primarily by his mother, Kamara was one of the most dominant players in high school. 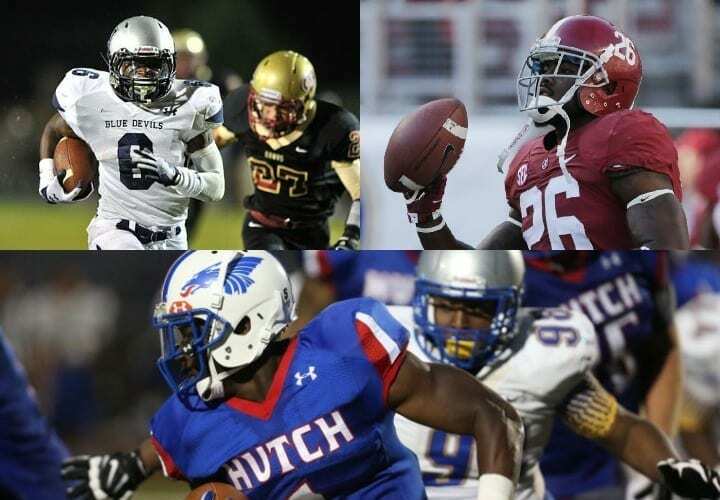 At Norcross High School (upper left), Kamara rushed for over 2,000 yards and 31 touchdowns his senior year all while capturing a state title. With a plethora of schools heavily recruiting America’s most versatile high school back, Kamara chose Alabama. Destined to be one of the great ‘Bama backs, Kamara’s tenure at Alabama got off to a rocky start and ended after just one year. Thanks to injury and some off-field issues, Kamara decided to transfer and found himself at Hutchinson Community College, a JUCO program in Kansas. After one year at Hutchinson, Kamra enrolled at the University of Tennessee and immediately proved himself capable of playing in the SEC. And proving himself in the SEC was very important to Kamara. After he left Alabama, critics suggested he may not have what it takes to play ball in college’s most challenging conference. 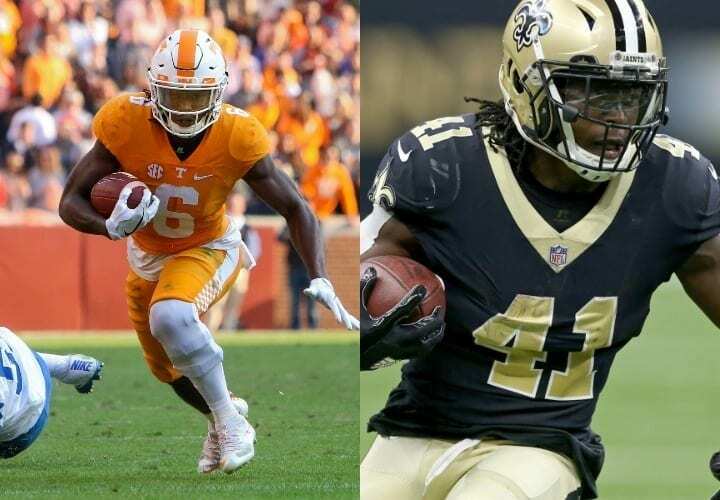 Drafted in the third round of the 2017 NFL Draft by the Saints, Kamara’s NFL career got off to a blazing-fast start. With 1,900 all-purpose yards and 13 touchdowns, Kamara was the 2017 NFL Rookie of the Year, Pro-Bowler, and second-team All-Pro. He’s a new breed of running back, one that can catch balls with ease and make defenders look foolish with a plethora of good jukes. He and Drew Brees should make up one of the most dangerous combinations in football. 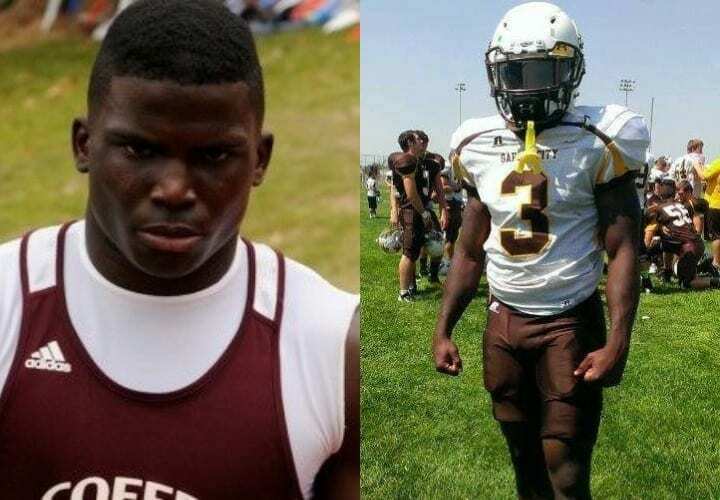 Considered one of the best high school sprinters, Tyreek Hill of Coffee High School in Douglas, Ga., won state titles in the 100 and 200 meter dashes and long jump during his senior year. There wasn’t a high schooler in America faster than him. To put his speed in perspective, had he participated in the 2012 London Olympics, he would have placed sixth. He was also a pretty good football player. Following high school, Hill attended Garden City Community College, starring there for two years. Although the competition was second-tier, Hill wowed coaches at the Division 2 level, proving he could play anywhere he wanted. Now it was time for Hill to take his speed to the next level and prove himself on the biggest stage. Hill then chose to attend Oklahoma State where he ran track and played on the Cowboys football team. On the gridiron, Hill was one of the nation’s most dynamic players, returning punts and kicks while playing running back and receiver. He also was an elite Big 12 sprinter, winning the 2014 Big 12 championship in the 200 meter dash. But what Hill couldn’t out run was domestic violence charges which led to his dismissal from the Cowboys. Hill’s next stop was the University of West Alabama. Although Hill only played there for one year and was projected to go undrafted because of his checkered past, the Kansas City Chiefs gambled on the speedy receiver and took him in the fifth round of the 2016 draft. Since entering the league, Hill has proven himself to be one of the most dynamic playmakers in the game. With two Pro Bowl nominations and over 1,400 all-purpose yards in each of his first two seasons, Hill is a certified star. 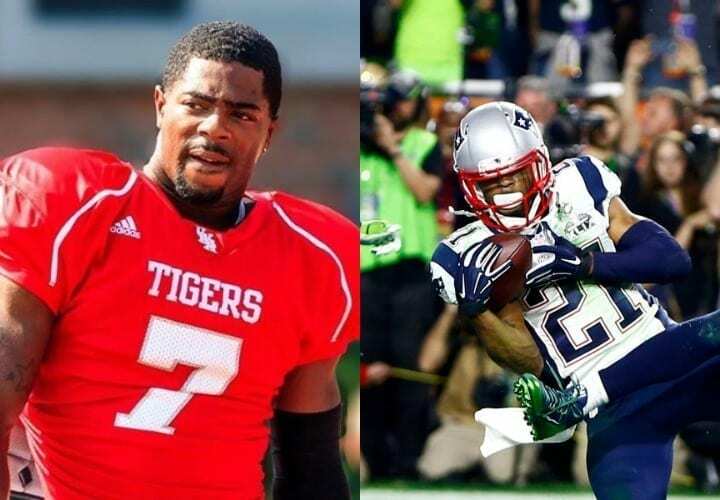 Known for one of the greatest defensive plays in Super Bowl history, Malcolm Butler’s road to the NFL followed a similar path of many of the players listed before him, a path that didn’t start out with a big Division 1 school. But Butler wasn’t deterred by the lack of big offers and made the best of his situation. 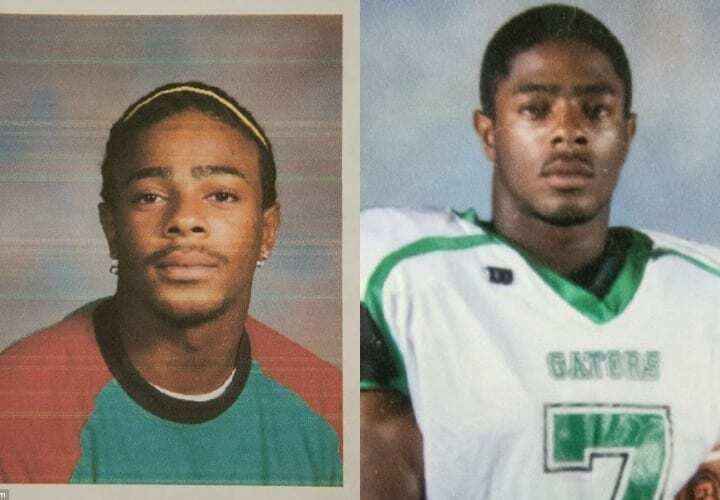 At Vicksburg High School in Mississippi, Butler only played for two seasons, his freshman and senior years. With not a lot of experience, Butler’s only chance to play at the next level came for Hinds Community College in Mississippi. Considering he only played for two seasons, receiving any offer, even from a community college, is an impressive feat. After his 2009 freshman season at Hinds, Butler was kicked off the team for a still-unconfirmed reason. From there, Butler took a job at Popeyes while taking classes at Alcorn State University. Luckily, after spending one year away from the game he loved, Butler was given a second chance at Hinds. Thanks to a stellar sophomore campaign (2011), Butler received an offer to play football at Division II West Alabama. A two-time All-GSC cornerback (Gulf South Conference), Butler went undrafted in the 2014 NFL Draft but signed as a free agent with the Patriots. Later that rookie season (2014), Butler would make the most improbable Super Bowl. With the game on the line, he intercepted Seahawks quarterback Russell Wilson to clinch a Super Bowl victory. 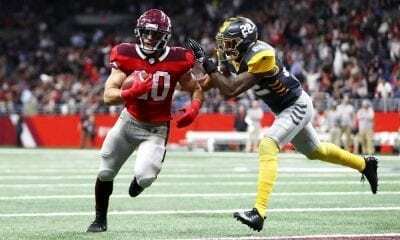 Two seasons later, Butler would again be crowned champion after the Patriots completed the most historic comeback in Super Bowl history against the Falcons. 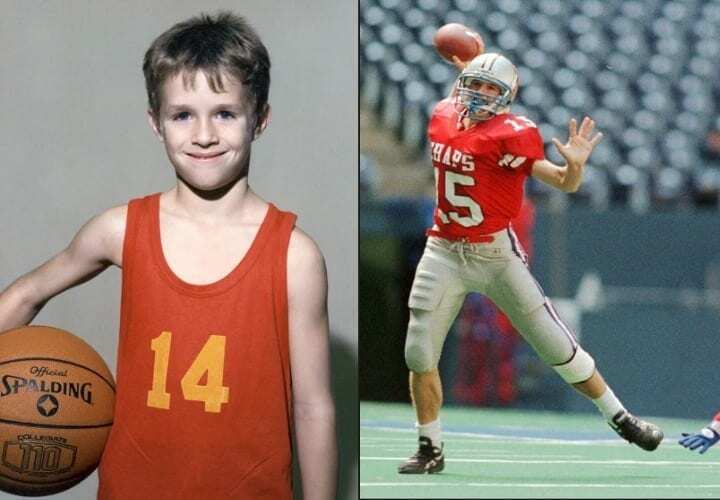 During his junior year playing for Westlake High School (Westlake, Texas), quarterback Drew Brees led his team deep into the Texas State Playoffs before tearing his ACL. 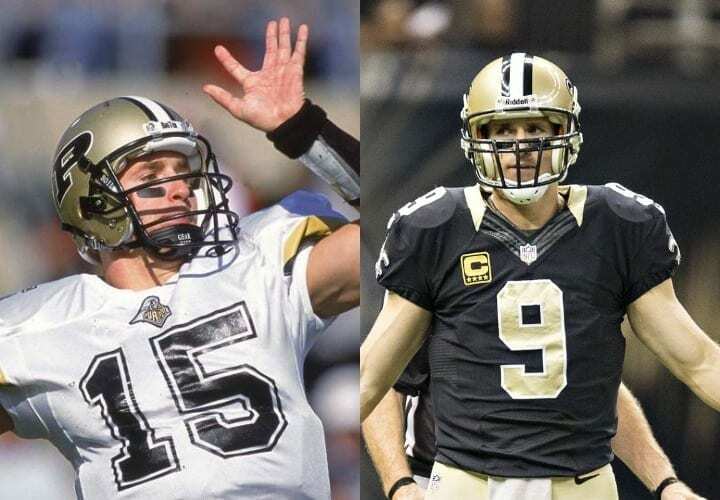 Injury aside, Brees was slated to be the starter the next season, and during his senior year (1996), Brees led the Westlake Chaparrals to a perfect season and 5A State Championship while being named the Offensive Player of the Year. Throwing for 31 touchdowns and 3,500 yards will do that. But no big D-1 offers came in, at least from the Texas universities Brees wanted to attend. With only Kentucky and Purdue offering Brees a scholarship, the QB went with Purdue. Despite not playing for the University of Texas or Texas A&M, Brees was excited to play Big 10 football, and even more excited to prove any of his doubters wrong. At Purdue, Brees finished his four-year career with 90 touchdowns and 45 interceptions. Brees also led Purdue to one of their most successful seasons since the 80s by leading them to the 2001 Rose Bowl where they fell to Washington by 10 points. Rose Bowl loss aside, Brees was one of the nation’s most prolific passers. But his size could mark his downfall at the next level. 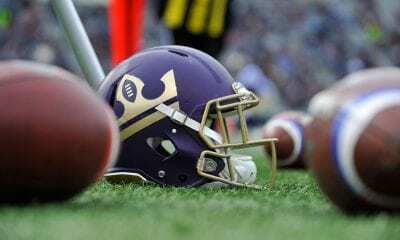 Initially considered too small and not strong enough to throw at the next level, San Diego gambled on Brees with the 32nd pick of the 2001 NFL Draft. Since entering the league, Brees has gone on a mission to prove doubters wrong. He’s won one Super Bowl, led the NFL in passing seven times, and, among a litany of other accomplishments, has shattered numerous NFL passing records. Located in the center of the state, Groveport, Ohio, is a small community with a population hovering just above 5,000 people. 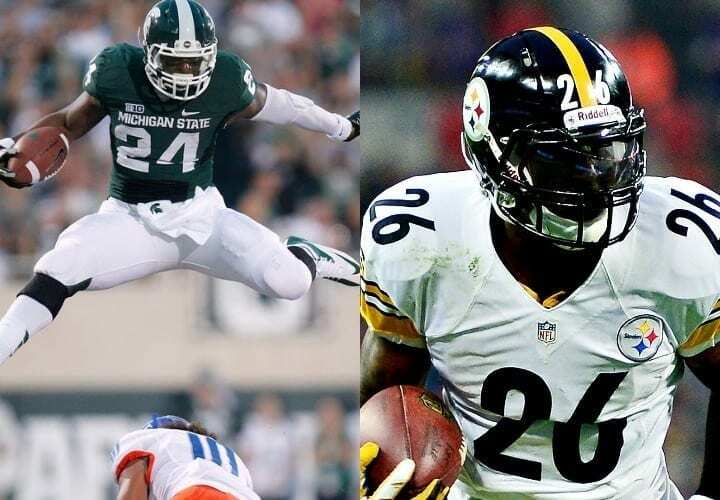 But for Le’Veon Bell, Groveport was home. During his senior year at Groveport Madison High School, Bell found the end zone 21 times but was only considered a two-star recruit. Only mid-majors such as Marshall and Bowling Green extended him scholarship offers. Known as a patient runner, Bell stayed patient with his college process and convinced the coaches at Michigan State to offer him a scholarship. It was his only offer from a power five conference. Although he would be playing for Michigan’s second favorite school, Bell would soon become the state’s favorite — and best — runner. During his three seasons at MSU, Bell accumulated 34 total touchdowns and was named an All-American in 2012. He was a crucial part of the Spartans revival that put the program back on the map. Now all that was left for him to do was go pro and prove, once again, he was worthy of a roster spot. With the 48th pick in 2013 NFL Draft, the Pittsburgh Steelers selected Bell, a unique runner who would help Pittsburgh’s explosive offense. To date, Bell has broken numerous Steelers rushing records while being selected to three Pro Bowls and two All-Pro teams. He’s also one of the most unique runners in league history thanks to his patient style that keeps him tip-toeing in the backfield until a hole opens up. Ten of his first 11 years were spent abroad living in Germany and London while his dad, a former NFL quarterback, managed the World League of American Football, the precursor to NFL Europe. And while Luck loved watching old tapes of his dad’s playing days, Europe’s favorite son was soccer, and Luck was hooked. But when his dad took a job in the Houston area, the Lucks were forced to go on the move again. 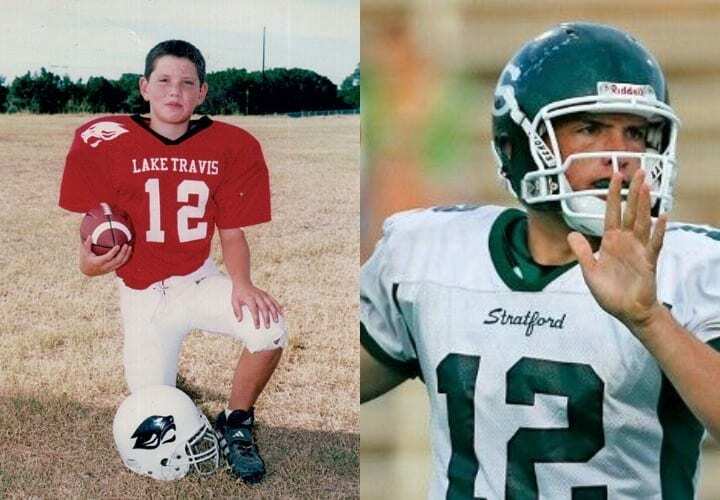 As a high school standout at Stratford High School in Houston, Luck was a five-star recruit and the co-valedictorian of his 2008 graduating class. 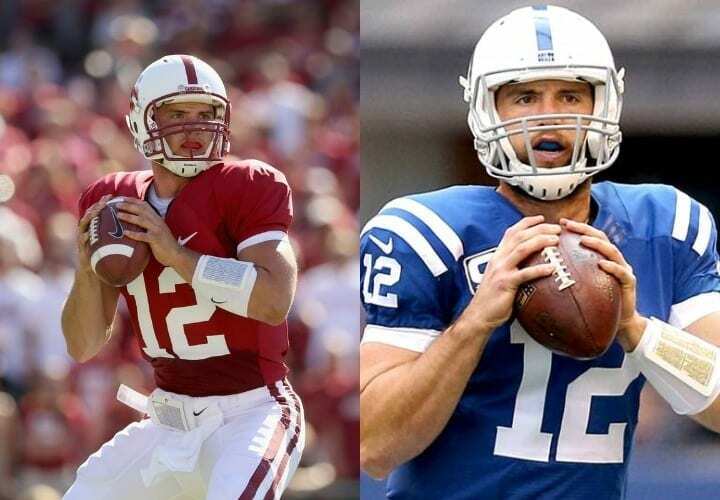 Highly coveted by top programs around the nation, Luck chose to attend Stanford University. Billed by many as the greatest quarterback prospect since John Elway, Luck did not disappoint. In his three years leading the Cardinal, Luck finished second in Heisman voting twice, led his team to two BCS Bowl Games — winning one — and was a two-time All-American. The only thing short on his impressive resume was a National Championship. A virtual lock to be the top pick, the Colts surprised no one by taking him first overall in the 2012 NFL Draft. To date, Luck has established himself as an elite quarterback (three Pro Bowls) while setting numerous rookie passing records, like yards in a single season with 4,374. Big Ben’s NFL journey started in the small town of Findlay, Ohio, located in the northwest part of the state. While at Findlay High School, Roethlisberger actually played receiver because the coach’s son was quarterback. But a nice case of nepotism wouldn’t keep Big Ben from throwing the ball for too long. However, Ben was named the starting quarterback for his senior year, once the coaches son departed, and in just one year as the signal caller garnered enough attention from Miami University (Ohio) to get a scholarship. Despite throwing for just a season, Big Ben possessed the physical tools to play college ball. A raw prospect, he’d need time to hone his skills but was worth the risk. Following his freshman year training camp, he was named the starting quarterback, and he never looked back. 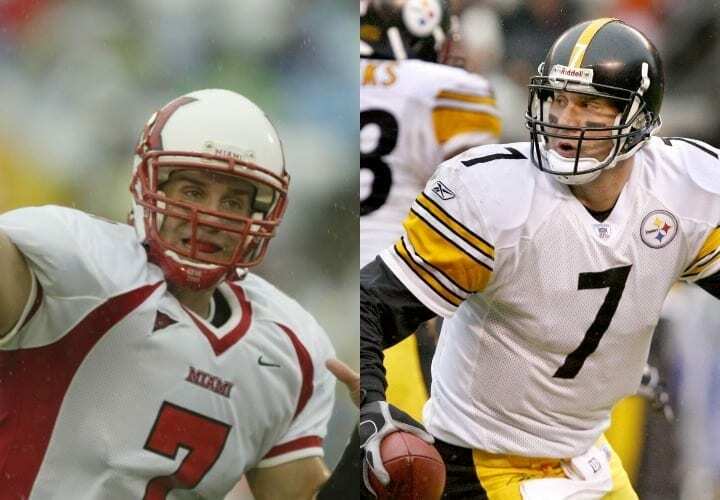 As a true-freshman, Roethlisberger commanded the offense and held the job for the remainder of his career, breaking virtually every significant school passing record after his three years playing for the Red Hawks. Despite Big Ben’s best efforts, Miami of Ohio was still always confused with the original Miami (Florida). Taken 11th overall in the 2004 Draft, Big Ben has led the Steelers to two Super Bowl victories and six Pro Bowls. He also established himself as one of the greatest quarterbacks in Steelers history while perfecting the art of escape. He can avoid defenders, lawsuits and career-ending injuries from motorcycle crashes with a natural fluidity.